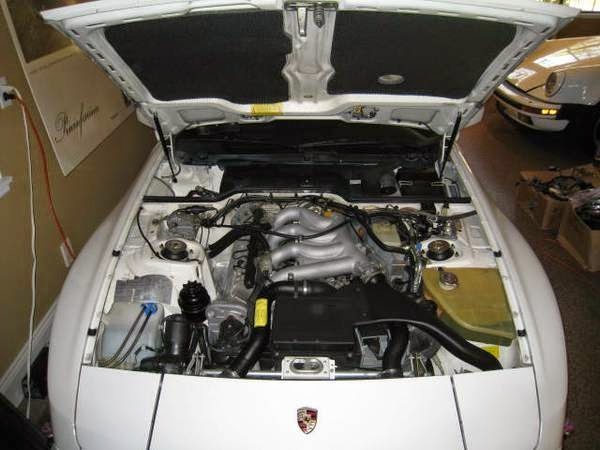 The Porsche 944 Turbo is also known by the internal designation 951 and is generally considered the best of the affordable front engined Porsches. I say generally, because some folks will prefer a 928 GTS and others will rave about the big bore 968, but the 951 offers the best combination of potential speed, handling and reliability with the Dr. Ing. h.c. F. Porsche AG crest on the front without getting into an air cooled 911. Todays example is in great condition with only 48k miles on the clock, but is offered at a fairly aggressive price point. 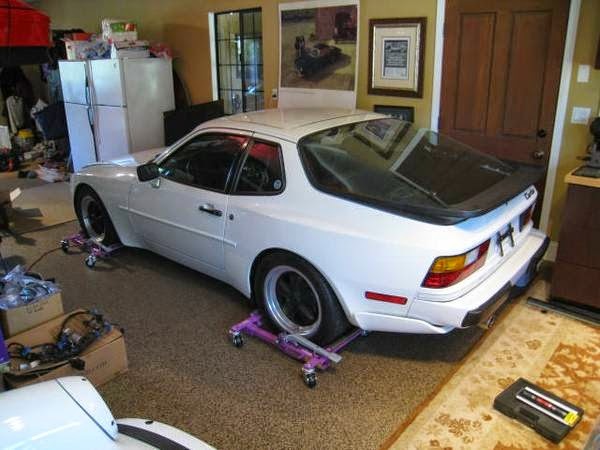 Find this 1986 Porsche 944 Turbo offered for $16,900 in Ventura, CA via craigslist. Tip from Erik. Truth be told, I have an ulterior motive for posting this car...it is because the location of the photos is so interesting. Is it a garage? A living room? A converted office space? It could be a finished garage that has been carpeted or it could be someone who has parked his 951 in his mom's living room. 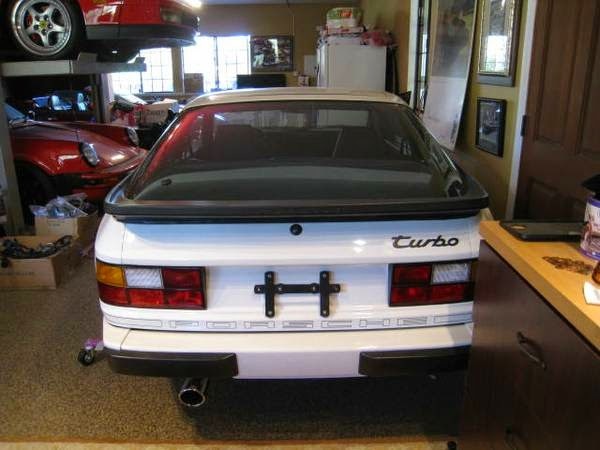 The Porsche 944 Turbo was powered by a 2.5 liter version of the basic 944 engine that has been turbocharged and intercooled to produce 217 horsepower and 243 ft-lbs of torque. The turbo also added a revised front fascia, bigger brakes all around, stiffer suspension and a strengthened gearbox. Now comes the fun part -- help us identify the cars and items in the background. What do you see? Comments below. That garage is awesome- half kitchen, half garage? The white 911 is an 87-89- you can tell by the bumper/foglight combo. Are those two refrigerators pushed together or an extra large super fridge? I've entered bizarro world. Two cars today (the 944 and the Impulse) were featured on BaT BEFORE DT. this just doesn't happen. I'm sure it's conicidence, but secretly hoping that it's some well deserved DT retribution. I haven't looked at BaT twice since shark jump day. Vince? CFlo? Phil? Hun? LMAO. You forgot a random stylistic comment like "It wears nice patina but if it were us we would throw on some magnesium phone-dials and just enjoy it"
Do you think I can get the fridge and the car as a matched set? "If it were us we'd throw some stainless handles on it and just chill". Love this site. I'm really compelled to comment on this one because there is something in the universe that lined up and somehow this car (my car), ended up here on DT and on BAT. Who would have thought? 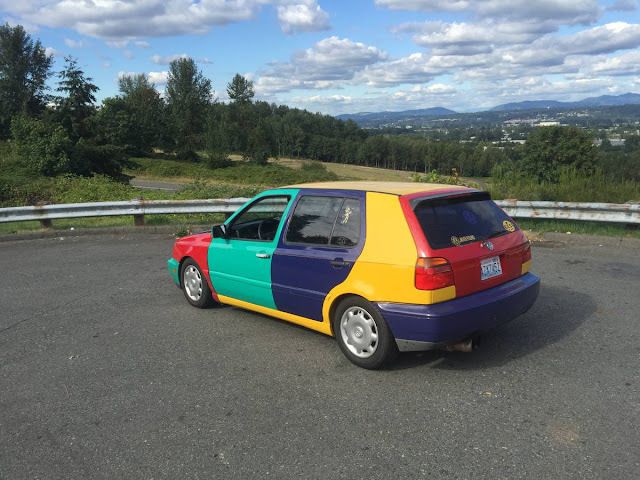 I had this on CL for nearly a month with not one bite, on Ebay for a few days with some limp bidding and absurd inquires, then through the pervasive readers of this blog, it sells today to a car dork just like me. I have received the most pleasure reading the comments about where the car sits! One guy said it looks like it's in his mom's craft room...and I love the comment on the matching fridge. Truth be told, it's my garage which I have tried to make as comfortable as possible because, with the blessing of an understanding wife, I try to spend all weekend in there. Good thing you can't see the rest of it...there is it's own organization of sorts but it's getting packed...hence the impetus of the sale. A beaut of a car though. Again, love the site. Big question: Did the buyer see it here? Also, feel free to tell the seller to send us some followup pictures of the car. P.S. Feel free to pick a name when you comment by selecting NAME/URL on the drop down menu below the comment box. No need to log in. Will do for sure. The buyer appears to be cut from the same cloth so I'm positive he will be into it. For the garage, I just had the floor epoxied and put down some throw rugs...if you can keep them moderately clean it works out great. My son and I are always in there tinkering on and mending well used Green Machines and Razors. It's perfect. Thx for the format and my daily entertainment! Hey seller, could you resolve one curiosity I had? Is that a Testarossa/512 on the lift? That's what I'm guessing but it looks like it has the 3 piece 550 Barchetta wheels so it's throwing me a little. Any way you cut it, you have a cool setup and an even cooler fleet of cars.